Kibosh is a simple to use repair clamp for leaking metal, plastic and multilayer pipes, it is re-useable, can withstand 10Bar pressure. Ideal for all trades people; for any type of perforation, it can also be used by anyone who could potentially have a frost damaged burst pipe. Unit is suitable for 1/2 inch pipes. Once fitted, the pipe can continue to function under normal pressures and temperatures until a permanent repair can be made. The air gap completely covers clamping collar and prevents the buildup of dirt. The body is made of polypropylene. Also available in store by special order only see store for details. This lever style handle is an easy way to restore a faucet to like new condition. Ergonomic design allows the user to turn the faucet on and off with ease. 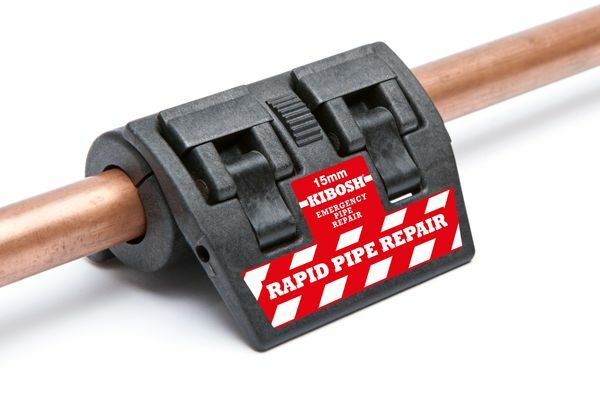 1/2 inch Emergency Repair Clamp Repair any pin hole, cracked or leaking pipes easily and economically with the KIBOSH Emergency Pipe repair kit distributed by JAG Plumbing Products. This innovative product, made in the UK, is a quick fix that allows you to temporarily repair a burst or accidentally perforated water pipe or leaky fitting with ease. JAG Plumbing Products brings on-line customers the best tools and repair parts. Experts in the field of plumbing repair parts; JAG Plumbing Products offers customers a selection of economic solutions for their every-day home plumbing repairs. The team at JAG Plumbing scours the world to bring The Home Depot customers unique, hard to find parts of the highest quality.